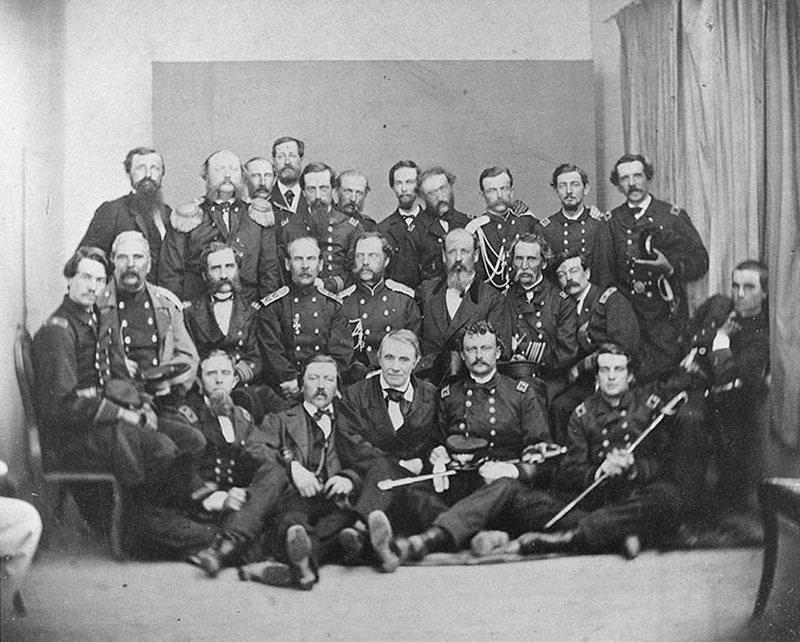 Secretary Gustavus Fox with Russian and U.S. officers, 1866. On June 7, 2016, the Army and Navy Club in Washington, D.C. will host a special event titled “Tying the Knots of Friendship” to commemorate the 150th anniversary of the U.S. Navy goodwill mission to Russia in 1866. Amid the current tensions between the U.S. and Russia, the naval visit of the mid-19th century stands out as a warm and generous meeting of two nations. Looking through the prism of modern-day geopolitics, there are stories that appear so outlandish to us now it is hard to believe they happened. Perhaps, for this reason, the following story from the annals of American-Russian relations has been almost completely forgotten in both countries. Indeed, who would believe that an American naval contingent approaching Russian shores would be enthusiastically invited to observe Russian Navy training maneuvers, troop reviews and a gun factory? Who would believe they would be greeted with “Hail Columbia,” fireworks displays, and toasts to America’s well-being and prosperity? Who would believe that on every occasion the American sailors would be tossed in the air, wined and dined, and showered with gifts? But back in 1866 this happened, as did this: An avenue in Moscow was named the Avenue of Americans; the head of the U.S. Navy delegation was made an Honorary Citizen of Moscow and of St. Petersburg; American sailors were shown the Young Oak that grew in St. Petersburg from an acorn taken from the tree that shades the tomb of George Washington. The amazingly warm reception given to the naval delegation can partially explained by the noble purpose of the visit. The naval contingent, headed by President Andrew Johnson’s Special Envoy, Gustavus V. Fox, Assistant Secretary of the Navy, was to dispatch a Congressional Joint Resolution to Tsar Alexander II, congratulating him on surviving an assassination attempt. The American delegation certainly expected to be met with appropriate diplomatic protocol, but the Russian hospitality was beyond even their wildest expectations. U.S. Naval Historical Center PhotographBanquet in Moscow, Russia, 13 (25) August 1866. The banquet was given for a delegation of the Congress of the United States. U.S. Naval Historical Center PhotographA view of labels affixed to the original print. The USS Miantonomoh and the USS Augusta crossed the Atlantic and as they neared the port of Kronstadt, on Aug. 6, were greeted with a 21-gun salute by the Russian fleet and solemnly escorted into the harbor, decorated with U.S. flags. That was just the beginning of a month-long celebration of the U.S. guests in Russia. On Aug. 8, the American delegation was received by the tsar. At that time Gustavus Fox presented him with the historic Congressional Resolution. The same words that were voiced that day during the exchange of solemn speeches were repeated many times during the sojourn of the U.S. delegation on Russian soil – pacts of partnership, brotherhood and love between the American and Russian people. Many incredible things occurred during Fox’s visit. He and his crew were invited to visit St. Petersburg, Moscow, Nizhny Novgorod, Kostroma, Uglich, Tver and other smaller places in the European part of Russia. The American guests met Russian aristocracy and merchants, clergy and peasants, members of the military and workmen. Many issues were discussed: international relations, politics, commerce, and the U.S. Alaska purchase. The U.S. sailors were invited to the Bolshoi Theater, to Russia’s best museums, libraries, archives, and cultural festivities. More than 60,000 Russians appeared at a festival in Sokolniki Park which the Americans attended. Everywhere they went the Americans were greeted with loud hurrahs and embraced: They exchanged heartfelt speeches and even shared poems. Fox read a poem entitled “From America to Russia” by Oliver Wendell Holmes, which was translated without delay by the Russian poet Apollon Maykov. Nearly 100 years after the visit to Russia by the U.S. Navy delegation, in 1959, the “The American National Exhibition” took place in Sokolniki Park, Moscow. Many thousands of Russians gathered again to meet Americans. This time, they were offered Pepsi-Cola, personally introduced to them by the legendary American businessman Donald Kendall. Inspired by the optimism of our ancestors, the American-Russian Cultural Cooperation Foundation, est. 1992, in Washington, D.C., will commemorate this joint page from history by the event with the optimistic title “Tying the Knots of Friendship.” It will take place on June 7, 2016, at the Army and Navy Club in Washington, D.C.
Alexander P. Potemkin is executive director of the American-Russian Cultural Cooperation Foundation.